High Quality: die-cast aluminum housing 4 pods (3 chips every pod) CREE chips (3W every chip), PC lens reinforced, IP 68 waterproof, 50000 hrs life span, could work at all conditions. Universal Fit (voltage at: 9-30V): designed for all makes and models, fit for car, truck, offroad, boat deck, sportbikes, cruisers, touring, ATV's underbody interior exterior etc. Show Yoursely: let your travel fascinating with 4 pocket-sized pods, different with others, just show yourself. 100% SATISFACTION GUARANTEE: no reason for return or change, hassle free 1 years warranty. Vehicle Service Type	Universal Fit (voltage at: 9-30V): all makes and models, fit for car, truck, offroad, boat deck, sportbikes, cruisers, touring, ATV's underbody interior exterior etc. 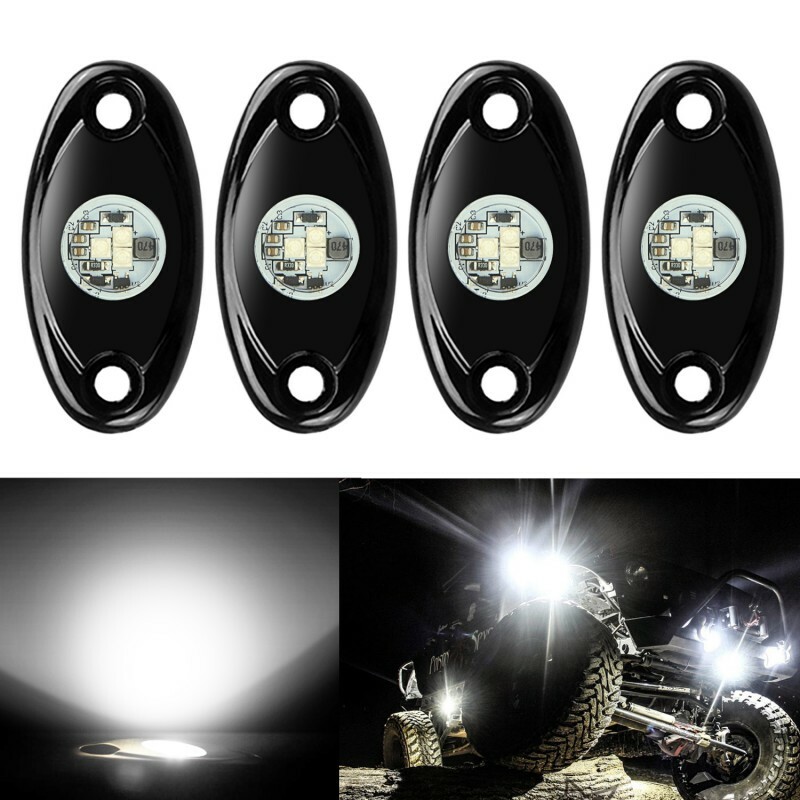 4 pods new LED rock light, universal fit for your car offroad truck or boat, could use for vehicle's underbody interior or exterior. 1, Let your travel fascinating with 4 pocket-sized pods. 2, Different with others, just show yourself. 1, DIY style, could be mounted anywhere you want. 2, Flexible design makes it easy to mount anywhere you want. Perfect for car's underbody interior exterior etc. 1, Wrapped in protective polymer to prevent any water, dirt, or excessive heat damage. 2, 50, 000 hrs life span. 3, PC lens of LED light thick reinforced, long-term use does not exist lens yellowing. 4, Die-cast aluminum shell with thick materials shockproof waterproof better, good heat dissipation, light decay, paint dusting aging, permanent will not fade. 1, Made for all makes and models. 2, Fit for car, truck, offroad, boat deck, sportbikes, cruisers, touring, ATV's etc. 3, Widely used in car lights, card lights, off-road lights, headlight machinery, agricultural machinery, construction lights, headlight excavators, forklift lights, snow lights, light armored vehicles and other vehicles with lighting. 1, Waterproof and anti-corrosion: it can be used in the rain or harsh environments. 2, Wide operating voltage range: it can be applied in different types of vehicles. 4 LED pods and short wire. Worry-free Ampper's 1 years warranty.